Understanding the tradition of Courtly Love (the solely poetic, unconsummated passion between a knight and a married noblewoman) as expressed in French music of the 15th century (sparse, ornate, and replete with artifice) is a reach for 21st-century audiences. 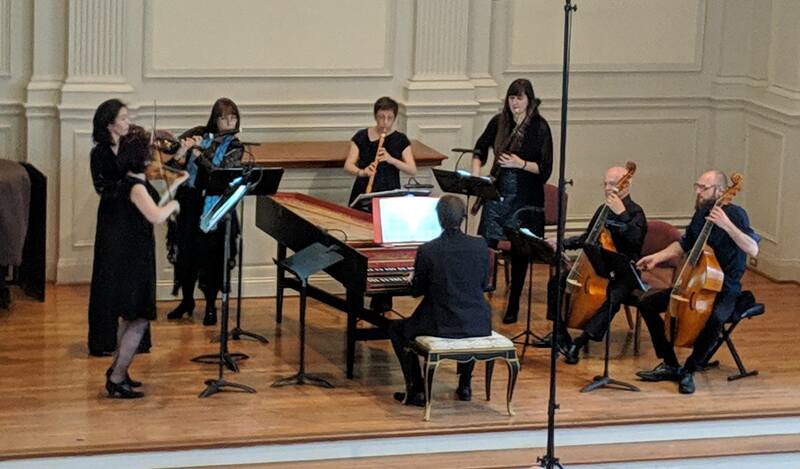 But Cleveland’s Les Délices and Chicago’s Newberry Consort brought some of the repertoire preserved in the recently-discovered Leuven Chansonnier to vibrant life on Sunday afternoon at Plymouth Church in Shaker Heights. 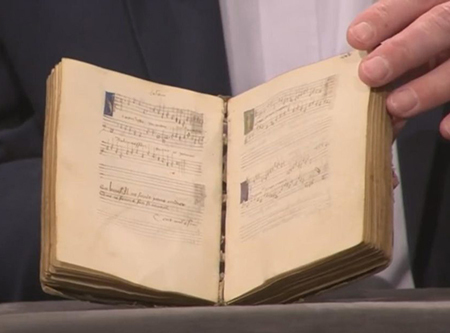 One of six tiny, personal song collections that survive from the era, the Leuven Songbook now lives at the Alamire Foundation in Belgium, but its contents originated in France’s Loire Valley. Les Délices director Debra Nagy wove fourteen of its selections into a narrative drawn from the contemporaneous Roman de la Rose — a late Medieval boy-meets-girl (or knight-meets-lady) saga illustrated with projections designed by Shawn Keener. 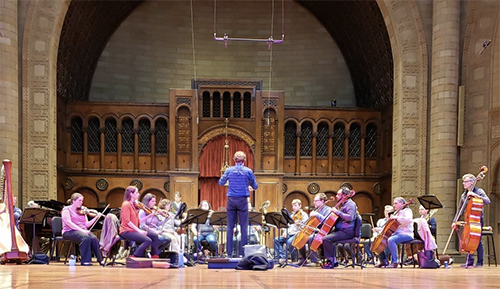 The hour-long concert, moved from Herr Chapel into Plymouth’s sanctuary to accommodate a larger audience due to the weather-related cancellation of Saturday’s Lakewood performance, featured eight musicians of the combined ensembles, several of them doubling on voice and instruments. 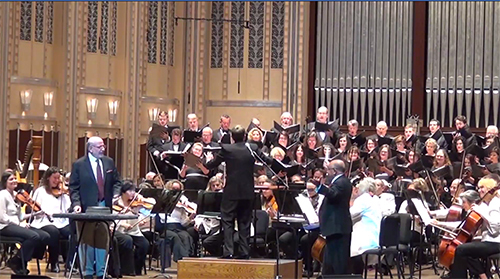 The excellent vocalists included soprano Ellen Hargis (co-director of the Newberry), tenor Jason McStoots, and baritone Daniel Fridley, as well as Nagy (who also played harp and Medieval winds), and lutenist Charles Weaver. Among the equally fine instrumentalists, Newberry co-director David Douglas played the vielle, as did Allison Monroe, who also brought out a rebec at times. 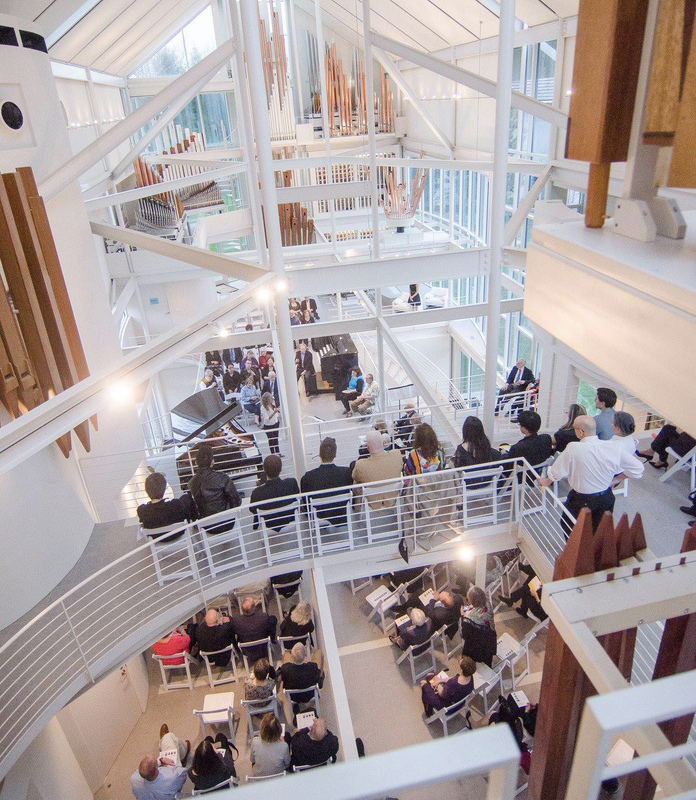 Charles Metz presided over an organetto — a little portable pipe organ — which added both sonic and visual interest. 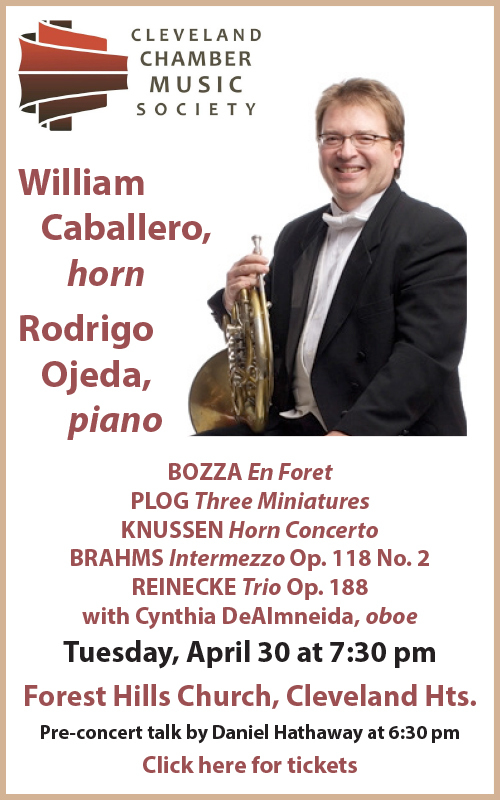 Most of the songs are in the 3-voice format favored by early 15th-century composers, and the pieces can be performed, as they were on Sunday, in various configurations depending on the imagination of the musicians. 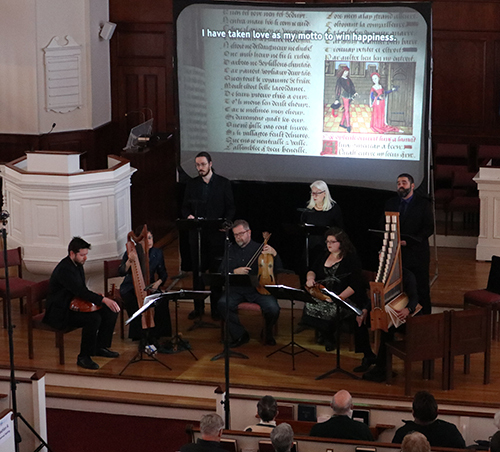 As the storyline progressed, the two ensembles gave the audience an eloquent introduction to the special world of 15th-century polyphonic song in pieces by Binchois, Hayne, and Ockeghem. Before the ear could grow weary with similar-sounding music, Nagy changed up the playlist for the feast episode of the story with arrangements of three animated basse danses that brought a drum into play. One of the interesting features of the Leuven Songbook is its inclusion of a dozen songs that were previously unknown. Les Délices and the Newberry included six of those — as yet unattributed to any composers — in the post-feast scenes where the poetic lovers decide to split, don’t answer each other’s messages, have a misunderstanding, and complain about the slavery of love. 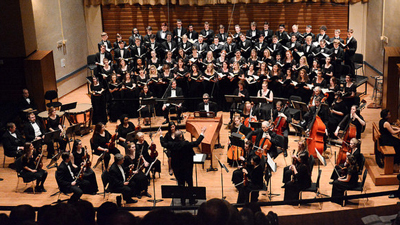 Every now and again, some real moments of passion flared out from the elegant polyphonic textures, as in Jason McStoot’s ardent singing of the Anonymous Escu d’ennuy. Finally, our knight sang about hope for the future — with other ladies. 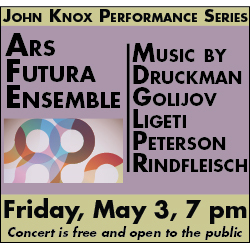 Those six new tunes brought fresh sounds to the second half of the program, as did some ear-tickling scoring (Agricola’s Comme femme desconfortée was a duet between the buzzy dulcian and the vocal-sounding organetto). 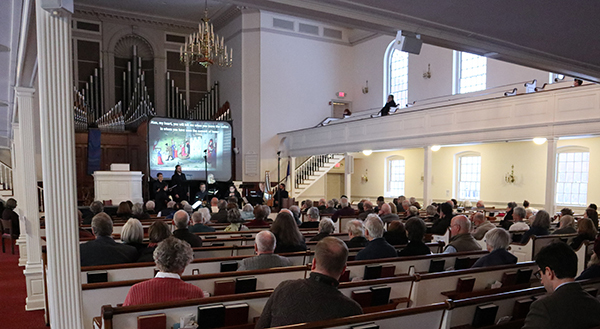 An hour before the performance, patrons had the opportunity to immerse themselves in other examples of manuscripts from the period in a hands-on pre-concert lecture. Photos by David Ellis, courtesy of Les Délices.